Albert Einstein and Max Wertheimer were close friends. Both found themselves in exile in the United States after fleeing the Nazis in the early 1930s, Einstein at Princeton and Wertheimer in New York. They communicated by exchanging letters in which Wertheimer would entertain Einstein with thought problems. In 1934 Wertheimer sent the following problem in a letter. An old clattery auto is to drive a stretch of 2 miles, up and down a hill, /\. Because it is so old, it cannot drive the first mile— the ascent —faster than with an average speed of 15 miles per hour. Question: How fast does it have to drive the second mile— on going down, it can, of course, go faster—in order to obtain an average speed (for the whole distance) of 30 miles an hour? Gestalt psychologists’ way to solve problems is to reformulate the question until the answer becomes clear. Here’s how it works. 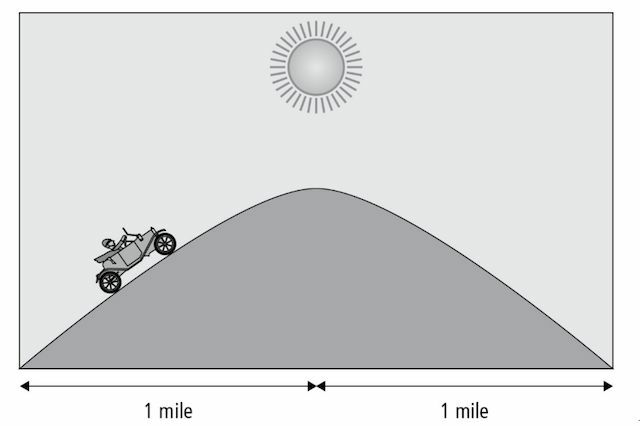 How long does it take the old car to reach the top of the hill? The road up is one mile long. The car travels fifteen miles per hour, so it takes four minutes (one hour divided by fifteen) to reach the top. How long does it take the car to drive up and down the hill, with an average speed of thirty miles per hour? The road up and down is two miles long. Thirty miles per hour translates into two miles per four minutes. Thus, the car needs four minutes to drive the entire distance. But these four minutes were already used up by the time the car reached the top. Richard Feynman has a gift for taking something that seems pretty simple and turning it into something beautifully complex. Watch as he explains how something as simple as rubber bands work.